Imp - the granddaddy of All :o) Now duely retired. `Eclat - our double blue eyed, blue merle girl. Emmarie - beloved! Lost to snake bite way too soon. Mini Rant - DO READ!!! I had to take a break and rethink the way I want to handle international shipping. Please read this page two or three times to winnow out all information, make some phone calls as suggested, grab a calculator and do the math! Yes it is bloody expensive, I know - but I'd like for you to realize this before you pick up the phone to call me or email me to inquire about our puppies. Every month we get 3-4 more or less serious inquiries to ship overseas. I spend a lot of time on researching the import/export rules for that country, the airline shipping availability - and at times even collect a deposit or payment and take a puppy off my website - just to turn around and refund it, because whoever is on the other end of the conversation has not done the math and now has a reality check when it comes to the bottom line. Let me make this blunt - you are looking at the list price of the pup on my website + $500 International Placement Add-On + roughly $1000 [depending on the age of the pup at time or purchase - for boarding, vet fees, trip fees, document fees + crate /bedding] + the actual ticket price + 3.5% of the amount paid in Paypal fees. In addition to that there may be currency exchange fees, tolls and import permit fees, and who knows what else at your end of the country. Do the math before you contact me!!! I will no longer allow changes of mind and refund deposits, boarding or vet fees in midst of transactions because you changed your mind, and still have a pup sitting here that could have went home with someone else 3 or 4 weeks ago! Once we come to the conclusion that we have the right pup for you, and begin with the process of getting it ready - I expect you to be committed and stick to it! No refunds unless something is wrong with the pup! Click here to see available Silver + Blue Merle Poodle Puppies or Chocolate + Cafe Poodle Puppies. Hi there and thank you for your interest in our merle puppies. Yes - we do ship internationally and overseas when possible. We are getting more and more inquiries about shipping overseas these days and I decided to add more detailed information to replace the old International Shipping Page with this new one. Please understand that International Import/Export is a lengthy and complicated process, that inquiries multiple vet trips, dealing with the USDA and intricate shipping requirements and a lot of time on the road for me, and endless hours on the phone with the authorities in order to make a smooth flight happen for the puppy. It is expensive too, and overall stressful and very time consuming. While I don't have a problem with that and will ship when I can if I feel that you are a good match for my puppies, I want to lay out a few more thoughts and things for you to do on your end, before you even contact me to see if a puppy is available and if I would ship it to you. I'm going to ask you to do read this entire page carefully and do some of your homework on your own, because it is very time consuming for me to do so for you if you are "just thinking" and a time waster for me and expensive for you, if one or the other thing here is not going to work out for either of us or going to be a problem somewhere in the midst of the process. I speak and write English and German. Everything else I can't do - sorry! While translation programs work more or less well [run 2 or 3 different ones at the same time and compare what is being said to get a better idea of important details], you will need someone on hand that speaks either English or German if you want to speak to me on the phone. The potential for misunderstandings with translation programs is huge - so be sure to have someone that can call and speak to me for clarifications. In regards to phone calls - when you call me and happen to get my voice mail - tell me who you are and what country you are calling me from. Then go back here to my website and email me as well. At this time I cannot return international phone calls - I have a great phone server but international calls are not part of my plan and I no longer have a landline. If I miss your call, I will email you back with a good time to call me again - but I can't do that if you do not email me first! In regards to calling - please keep in mind the different time zones. We are EST [Eastern Standard Time] and if you are calling from Europe, you are 6-7 hours ahead of us. Best time for you to call is mid afternoon your local time [2-3pm] - this is mornings here and I am either in the office or working with the moms and pups here in the house, before I go outside to the kennel. Our silver and blue merle puppies for breeding start around $1100 and go up to $1500. Our chocolate and cafe merle puppies start at $1250 and go up to $1750. Price is subject to colors, merle patterns and conformation, as well as eye color. Blue eyes add to the value and "ooooh" appeal of the puppy and cost more. I generally cannot tell if a pup has blue eyes or how much blue there will be until the pup is 7-9 weeks old, so all initial price quotes are for puppies with brown eyes. For international placement, the price for your puppy is the advertised price on the website page plus an additional $500. No Exceptions! Why the upgrade? Because you will be one of a few [if not the only one] who has a merle poodle puppy [whether you plan on breeding straight poodles or poodle hybrids] in your country, and because I deal with a lot of stress, misinformation and aggravation with the authorities in charge, in order to get your puppy to the point where we can send it on a plane to you. Having a merle sire for your ladies will give you an edge over the competition, and allows you to raise your prices considerably. Other breeders [your competition] will be trying to purchase your puppies, and you can recover your import expenses in studfees during your first year, if you choose to do so - or with your first or second merle litter if you get a good percentage of merle puppies in them. The full purchase price of the puppy must have been received by the time the pup is 8-9 weeks of age in case of early reservations, or at time of purchase for a pup that is 8 weeks or older. The total amount is depending on the age or your puppy, and includes ongoing shots until 3 months of age, deworming, heartworm treatment, grooming etc and learning to go outside to potty after 3 months of age. I can't garantee that the puppy is 100% housebroken, but it will be well on its way by the time s/he gets to you. Boarding fees start when the puppy turns 8 weeks old [my usual release date for pups to go home]. If you are choosing an older puppy that is already listed on the website, the boarding fees start at the time of purchase. Most pups send overseas need to be app. 4 months old before they can be shipped, some countries require 6 months of age + up to 120 days of quarantine after arrival in your country. I really don't like sitting on a puppy until it is 6 or 8 months of age and then sending it off - this is emotionally really difficult for me the older the pup gets. Allow for a minimum of 7-8 weeks for boarding if you are purchasing a young puppy, depending on your country's import rules. [If we are prepping two same size/compatible pups for combined shipping, the weekly fee for two pups is $110]. In case of long term holding requirements and quarantines beyond the 4 month mark, the fee is @250/month and includes basic house breaking, crate training, some obedience training [name recall, leash walking, going out in public places, riding in the car, sit, recall etc.] plus feed and ongoing grooming. Boarding + vet prep fees must be paid in advance for the months they occur in, with a final tally including the shipping expenses a week before we ship. The prep work for international shipping requires usually 3-4 trips to the vet, in order to meet the import/export regulations. All vet expenses are estimates, and are subject to actual vet fees and your individual country requirements. Shipping to certain countries with extremely complex import requirements may require additional repeated vet trips for rabies titer test, brucelosis, and other veterinary testing or vaccine protocols, and may be considerably more than the above outline. Some Genetic Testing is available at buyers expense - inquire for details. You will pay for the actual occured vet expenses plus gas/trip fees out of the monthly payments, with a final tally a week before we ship. One of the questions that comes up a lot and often seems to be a deal breaker after days and days of emails and phone calls - is the actual cost of shipping, so be sure to make finding out about the actual shipping costs before contacting me!!! It is expensive - no questions asked. Airline prices are subject to change with the seasons and economic happenings, so be prepared to leave a bit of wiggleroom in your budget for that. It gets more expensive if your airline requires a Third Party Shipper to make and handle the actual shipping arrangements. All international shipments usually go to the main airport[s] in your country - as this is where your States Veterinary Office is located, and dogs shipped internationally will be seen by him/her before they are released to you. If you live in a country where Delta Airlines flies into [and accepts pets flying as commercial shipment - be sure to ask for that specifically!!!] - it will be the least expensive option in regards to shipping, as I will make all the shipping arrangements and do the legwork required to get the pup off the ground. Some airlines [Lufthansa, KLM, AirFrance and some others that I may not have experience with, but that are the only airlines that will accept pets flying by themselves into your country] require the use of a 3rd party shipper which will add considerable expense to the cost of your puppy or dog and can be as much as the price of the puppy all over again or more [I get shipping quotes using a 3rd Party Shipper that range from $1500-2500 upwards for the shipping part alone!] However if that is the only airline that allows a pup flying by itself to your country, and you want a merle poodle - it can't be helped, short of you flying in to Atlanta [or preferably Savannah], to pick up the puppy yourself. Before you email or call me or do anything else, take a few minutes and call up the airlines that fly into your country to see if they accept pets flying as commercial shipment by themselves [you need to ask exactly that - use no other terminology as you will get a lot of misinformation otherwise]. Check with Delta Airlines first and then work yourself down the list if they do not ship to your country. Ask for their specific rules and regulations, and get an actual price quote, with Atlanta GA [ATL], as the Point of Departure. Then hang up the phone and call them again and ask the same questions all over again [you should get a different customer service rep]. Why? Because - as sad as it sounds - no two customer service reps usually have the same information on hand, some are not updated on new procedures and events, and some really have no clue as to what they are doing, and others really don't care one way or the other. So call at least twice, better three times and then compare your notes. Save links to websites and send them to me, if we decide we are going to ship to your country, so I can doublecheck and compare the informations given. On occasions the info of airlines is not compatible with our Export and/or your Import Regulations, and can be contradictive. If we prep and hold a puppy for you for international shipping, and at the end of 4 months or more, we cannot ship because you received incorrect information or found out that the cost of shipping is not what you thought it would be, we all wasted a lot of money and time, and the puppy could have went home with someone else 2 months ago. In a case like that I will not refund the purchase price or any costs and expenses paid by you - but I will give you up to 30-45 days to make alternate shipping arrangements on your own or to fly in and pick up your puppy in person, before finding another home for it. 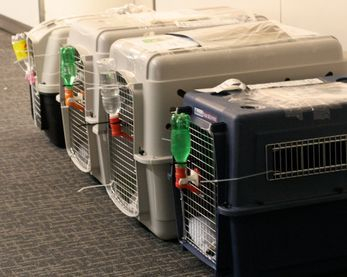 5.1.13 Update: Delta Airline is at this time having a shipping embargo for pets flying alone in cargo to all states of the EU, this is having to do with the type of airplanes they are using, not with the pets themselves. Until they change the accomodations for the pets [this embargo has been in place since early 2012 and it don't look to me that there are any changes coming any time soon], I cannot use Delta to the best of my knowledge. Be sure to call them anyways to see if anything has changed since I have last inquired. Pups shipped as commercial shipment [all pups traveling by themselves uncaccompanied are considered commercial shipments as far as the USDA is concerned] need to leave from Atlanta and the final vet check, USDA approval and drop off @ the Atlanta airport all needs to be accomplished within 24 hrs. But realistically - - - it needs to be done within 4-5 hrs to meet the time schedules for flights etc as the pup needs to be dropped off 4-5 hrs pre-flight. That means that I am driving to Atlanta [app. 4 hrs oneway trip], depending on the actual appointment times either setting up overnight in a hotel near the USDA Office for a first morning appointment and then straight on to the airport for drop off, or driving up there early in the morning hours and then wait with the pup in a hotel until the drop off at the airport. Depending on the time of the USDA appointment and actual flight schedule, I may skip the hotel and bring another driver along to do some of the driving [we are talking about 10-12 hrs in the car]. If there is a long wait between the appts. or I need to be there first thing in the morning, I may need a hotel room. During the hot months [May through September] it will be too hot to stay for hours in a car without it constantly running the AC, and it is simply going to be too hot to be outside for any considerable amount of time for the pup [our furkids are raised inside our climate controlled home]. I will need to wait to confirm that there are no issues with the paperwork, recent policy changes, or delayed flights at the airport prior to shipping [that is another 4 hrs just sitting there to make sure all is fine] and then I have another 4 hr drive back home. This means I am gone longer than 24 hrs from home and will need to pay my help overtime to handle the dogs for me. Immaculate planing and scheduling is really important at this stage, as otherwise we may get turned away at the airport for one reason or the other and have wasted expenses if the pup cannot make the flight as scheduled. The $175 doesn't even come close to covering the time, hotel stay, meals and gas needed to drive back and forth and all over Atlanta, or to pay my kennel help to come back in the evening to check on the pups or spend the night at my home. This later fee may be a lesser amount if the pup does not need to be shipped commercially and you are flying in to pick him/her up in person. I am not sure about the USDA expiration date for non-commercial shipments [24 hrs for commercial shipment], so be sure to check with me for the actual fees if you are flying in to pick up in person, if I still need to drive to Atlanta to get the documents approved or to meet you there at the airport, the charge will be the same. Actual Crate and Bedding expenses + the actual ticket fees. I strongly recommend to add extra insurance for the flight - it usually won't cover all of your prep and puppy costs, but I feel better for it, just in case your puppy is the first one of my dogs something happens to, while enroute. The expenses for crate[s] and bedding vary, subject to quality and manufacturer and size of course - and depending when we send 2 or more pups if they can travel in a larger crate together or need two individual crates. Allow at least $80-130+ for this, depending on sizes and numbers needed plus the cost of the ticket + Insurance. To give you an idea of the shipping cost for one pup recently [4/2013] shipped to the UK - the ticket via British Airways came to just a tad over $1000, crate and bedding for a 4 mo old pup $60. Depending on the airlines used [f.e. Delta and British Airways allow that], I can sometimes send two or more puppies on the same ticket for a small upgrade in price [sometimes in the same crate, sometimes in two crates], saving you considerable expenses such as on the actual ticket price on the second pup, boarding fees, and trip/gas fees. Many breeders purchase two merle pups and sell one to recover some of their import expenses or go half with a breeder friend on some of the expenses such as tickets, boarding + maintenance, and trip fees. Tolls, Import/Destination Fees, Taxes etc. Some countries have added fees that you will pay after your receive the puppy on your end. This can include [but not limited] to tolls, import taxes, destination fees and whatever else they can come up with. It is your responsibility to inquire about these. I'd suggest that when you call your airlines be sure to ask if there are any other expenses involved for importing a pup from the USA. They can usually tell you about this, or direct you to the proper authorities to learn more about this subject. Import and Export Regulations vary by country, but in either way I am bound to follow the Rules and Regulations of the Department of Agriculture [USDA] here in the USA. They take precedence over your country's import regulations, as otherwise the puppy does not leave here at all. Sometimes airline rules and Import/Export do not complement each other or give conflicting informations - all must be met, and the more stringent ones take precedent over the lesser strict ones, in order to avoid having a puppy sent back or not accepted for shipment. Start your search on the following web page, look up your country and then go from there. If they know of any corresponding websites for your individual country, the link is usually listed there as well, but do some independant research of your own as well. Check with your breeder community if they know of any good websites discussing imports to your country or google for additional information. Start here! Scroll to the bottom of the page and select your country! Save the links to your computer and once we are communicating send me the corresponding links to your country's import regulations. There are no refunds for expenses or puppies purchased if we can not send due to you not having the correct information!!! If we have the wrong vet prep info and we need to duplicate vet trips due to wrong info received from you, this will simply cost you more money. Do your homework correctly so we can reduce the aggravation and stress involved in international shipping procedures. Good communication is really important and so is timely follow up! The USDA Paperwork Fees are $38/pup at this current time [5.1.13] and are subject to change. For most puppies 8 weeks or older we are talking about 4-8 weeks [puppies are at least 4 months of age when we can send them, that is if your country has fairly easy import regulations]. I usually start the pre-shipping veterinarian prep work at 3 months, when the pups are old enough for micro chipping and their rabies shot, and then ship about 3-4 weeks after that. Occasionally I may have an older pup or teenager already on hand that has all the preliminary vet prep work done that can go as soon as I can make the time for a trip to Atlanta - but that happens rarely. Feel free to ask though! If you live in a country that prohibits docking of tails and removal of dewclaws, you need to get with me well in advance of our next litters and stay in touch, as I usually dock around 3-7 days of age. This puts you somewhat in a disadvantage - normally when I accept deposits for very young puppies, I allow my puppy buyers to swap to a sibling or different puppy if I have one they like better or that looks better as it matures than the one they initially selected. This is especially important when we are talking about placement in breeding homes. Obviously I can't offer you this advantage as the remainder of the litter will be docked as usual. You will need to make your selection within the first week of a puppies life - that means you select by coat pattern and by my suggestions and experiences, and hope for the best. If a very young puppy does not live up to your expectations, part of your payment or deposit will go towards a later docking of the tail by a veterinarian, so I don't occur the loss of a sale [or need to sell it at a reduced price for a long tailed pup]. The remainder of any moneys paid may be used towards a different pup of your choice [you are starting all over again waiting for another litter to be born]. Deposits and Payments are non-refundable if you have a change of mind!!! Please see my Paid Waiting List Page for more info about placing an early deposit for a puppy with a natural tail! I must know that you are serious about purchasing a puppy from us and have a commitment to buy. A $200 deposit puts you on my contact list for merle puppies when they are born - you have anywhere from 3-5 days from that time on to commit to a purchase before I dock the tails - timely communication is of the essence!!! There is already a page with this subject here. All of my merle poodles at this time are CKC registered - this is Continental Kennel Club, not Canadian. Here in the USA we have several other all breed kennel clubs other than the most well known AKC [American Kennel Club]. I'm sorry - that may also mean that in most cases you cannot register our merle poodles with your country's main registry, but you may be able to register with some of your other pet registries if your country has them. Some of our merle poodles go to poodle hybrid breeders such as CockerPoos, MaltiPoos, PekePoos, Aussiedoodles and Golden & Labradoodles for merle poodle hybrid babies, in which cases registry may not be an issue for your buyers. I believe that most of our dogs used for breeding overseas are simply named as american imports and copies of their pedigrees used in lieu of registration papers - at least for some of the hybrid breeders. That said - there are AKC registered poodles available in the USA, but they were not available 7 years ago when I first started breeding merle poodles [and I had been seeing merle poodles for about 3-4 years prior to purchasing my first one myself], and I honestly don't feel like starting over again or cheating like some other breeders have done, in order to procure AKC papers :o). Sorry - not going there! Some Genetic Testing is Available @ Purchaser's Expense. I personally have not tested any of my dogs, other than very thorough exams from my veterinarians. Several of my puppies and adult dogs out of my breeding have been successfully tested at other breeders homes, with all of them passing their genetic tests, as far as I am aware off - at least I have not received any notice otherwise. We have recently offered early prcd-PRA testing for puppies on the request and at the expense of the purchaser. This runs app. $300 for early micro chipping, blood work and testing [that reduces some of the vet trip#2 expenses, as at that time only a rabies shot @ 3 months is required]. If your chosen puppy should be affected, I will allow you to switch to a different puppy from a different litter and have it tested it at my expense. All international payments must be paid via Paypal . There is a 3.5% surcharge for payments accepted via Paypal to help with the fees they hit me with in return. I am now also experimenting with Direct Wire Transfer [the later is available on a limited bases and must be initiated by my bank], that may or may not work within certain countries, as this is with my "online only bank". We can try if you wish as an alternative to Paypal, it may be less expensive in regards to fees when available. The puppy's full purchase price is due at time of purchase or no later than the puppy being 8-9 weeks of age. A $200 non-refundable Deposit puts you on the Contact & Paid Waiting List for new merle puppies or if you need a merle puppy with a natural tail. I expect you to bring that deposit up to $500 when you make your actual puppy selection. Monthly lump sum payments of a minimum $400-500 [or more - your choice on how you space out the payments in order to avoid a huge final payment] to go towards boarding and vet prep fees begin when the puppy is either 8 weeks old or at time of purchase if the pup is already older than that. I prefer to get them either at the first of the month or the 15th, whatever works better for you. The final tally [includes the actual price of the ticket etc.] will be available and must be paid in full a week before shipping and prior to me making flight and final vet arrangements. If I over-calculate, I will refund the difference in the same way it has been paid. If a 3rd Party Shipper is required, their payment must be paid in advance prior to me dropping off the puppy with them, and my final amounts due must be paid prior to this as well.